MyCLI is a command line interface for MySQL, MariaDB, and Percona with auto-completion and syntax highlighting. If you're on macOS you can install it via homebrew. If you're having trouble with the quick start, check the install page for detailed instructions. 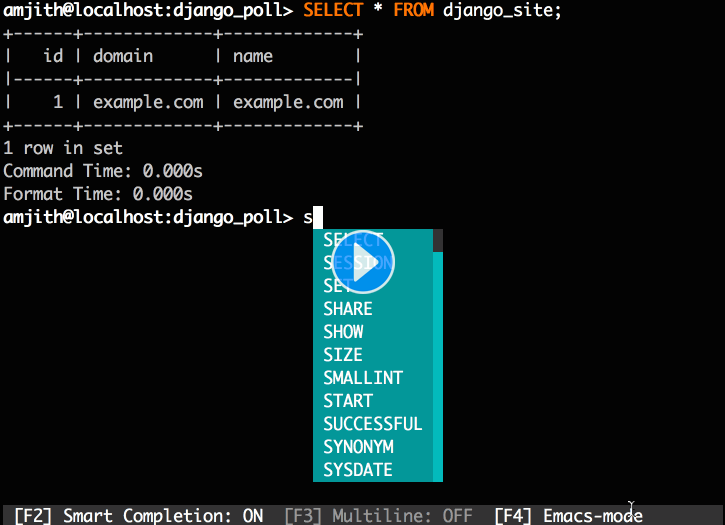 A MySQL terminal client with auto-completion and syntax highlighting. -h, --host TEXT               Host address of the database. -u, --user TEXT               User name to connect to the database. -S, --socket TEXT             The socket file to use for connection. -p, --password TEXT           Password to connect to the database. --pass TEXT                   Password to connect to the database. --ssl-ca PATH                 CA file in PEM format. --ssl-cert PATH               X509 cert in PEM format. --ssl-key PATH                X509 key in PEM format. --ssl-cipher TEXT             SSL cipher to use. -V, --version                 Output mycli's version. -D, --database TEXT           Database to use. -R, --prompt TEXT             Prompt format (Default: "\t \u@\h:\d> "). -l, --logfile FILENAME        Log every query and its results to a file. --defaults-file PATH          Only read MySQL options from the given file. --myclirc PATH                Location of myclirc file. -t, --table                   Display batch output in table format. --csv                         Display batch output in CSV format. --warn / --no-warn            Warn before running a destructive query. --local-infile BOOLEAN        Enable/disable LOAD DATA LOCAL INFILE. --login-path TEXT             Read this path from the login file. -e, --execute TEXT            Execute command and quit.